Cette video a été réalisé par A. Bousquet (MACS 2009) dans le cadre de son stage de fin d'étude à Indiana University intitulé "A multilevel method for finite volume discretization of the two-dimensional nonlinear shallow-water equations"
[Extracted from here] This test problem considers the propagation of a Rossby soliton on an equatorial beta-plane, for which an asymptotic solution exists to the inviscid, nonlinear shallow water equations. 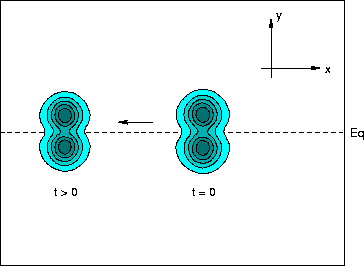 In principle, the soliton should propagate westwards at fixed phase speed, without change of shape. Since the uniform propagation and shape preservation of the soliton are achieved through a delicate balance between linear wave dynamics and nonlinearity, this is a good context in which to look for erroneous wave dispersion and/or numerical damping. A schematic diagram of the domain and expected properties of the solution is shown in Fig. 1.